C is for Calvin, John, of course. Here is a great and basic way to introduce children to the church's beautiful history. Why is church history important? Why do you want your kids to know who Hippolytus is? Ignatius? Tertullian? Zwingli? Because, speaking generally, as the Christian church in America - we have no idea where we've been and so we are making things up as we go along! We're spirit-seekers but we don't care what God (who never changes, by the way) has taught others long before our great-great-great grandparents were ever born. We need to learn church history because God isn't in our "sacred" music anymore. We've replaced "He" with "I" and sing about ourselves. (This really should be embarrasing, folks.) We fail to realize how many people have sacrificed and studied to give us a firm foundation to build on. We all just want to get along but we don't understand how much blood was shed to build up the church in the first place. Catacombs? What was their duel purpose? Colosseums? Just for gladiators? People traveling long distances under horrific conditions to gather together and confirm doctrine? How hard was that? We think we now know better but we know less now than ever before because we don't pay attention to our past. We don't understand why there are Baptists and Methodists and Presbyterians. We just think people are being silly and we should just wave flags in each other's faces and shout hallelujah really loudly. That'll be enough. We'll stumble and bumble our way along - laughing (again) as we go. Sometimes I'm tempted to think that not knowing church history is cheap faith. (For the record, I also think that high school seniors who don't know which country America went to war with to gain her independence value not their American citizenship!) Learning and studying history is not a bad thing. Instead, I think it's a sign of humility to realize that we, individually and in our present day situations, do not have all of the answers. It is a confession that the past is necessary. It is a concession that people slaved away to build a solid and firm foundation for us to stand upon as a church. In short, we have a thing or two to learn. 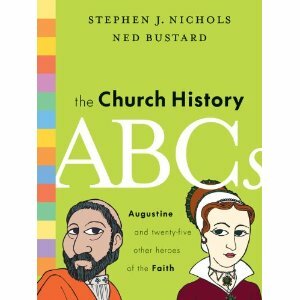 I was ecstatic to see that Crossway was offering The Church History ABCs because I see it as a valuable tool to use with the newest generation. To teach children that their past is ancient and rich is incredible! To share with them passion and purpose that was owned by people centuries ago who argued and even bled and died for truth is a sacred honor. I once heard it said that children should grow up and know more than their parents and be more mature than their parents ever were. Why is that? Because their parents should have taught them all that they know, sharing the lessons and truths that they possess. Then, when the children are launched from the firm foundation passed along from their parents - they will fly further. They will increase in wisdom, knowledge and understanding. The parents can be proud of that and excited to see where their children go with the truths that they have been faithful to guard and pass along. We, the Christian church today, are children. But we've forgotten anything that any of our elders have ever taught us. There is no better time than the present to return to the past and find out why things are the way that they are. It's time to grasp hold of old and confirmed truths in the Christian faith and press forward with them. Thank you, Crossway, for making this resource available. I hope we will learn to use it correctly. I confess my knowledge of church history is lacking! This would be a great book for me AND my kids. I am excited about this. I started learning church history while home schooling my kids...I was amazed. I would love to learn more about church history. This sounds like a great one for this homeschooling mom to check out. Great review, as always! Great Review! I'm always on the look out for books that will teach my childen about God and religion. Thanks!